Elias: Hello Alex and thank you for the opportunity. Tell us a few things about how you first joined FLAMES back in the 80s. 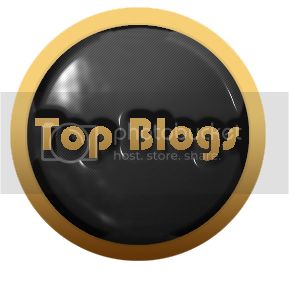 Alex: Hi Elias first of all congratulations for Burst.gr its really a great site. At 1984 I created a metal band with 3 friends of mine, where we used to play Power Metal and made some gigs at schools and a demo. The problem was I preferred to play thrash metal so in 1986 Flames (they had already two albums on the Greek market) tried to find a new singer because they had a similar problem, they wanted to change their style to thrash metal but Nigel (Lakis) preferred power metal, so I had a session with them and I joined Flames, the bass player from my ex band Fotis joined Nigel’s new project Thanatos inc.
Elias: FLAMES have been around for almost 30 years. 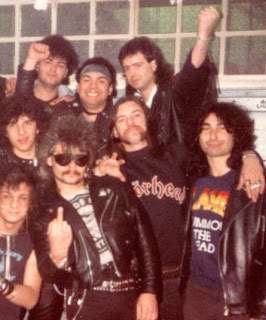 Except the fact that they were one of the first Greek metal bands around, they also were the first big Greek thrash band. How was the scene back then for thrash and for Heavy Metal in general? 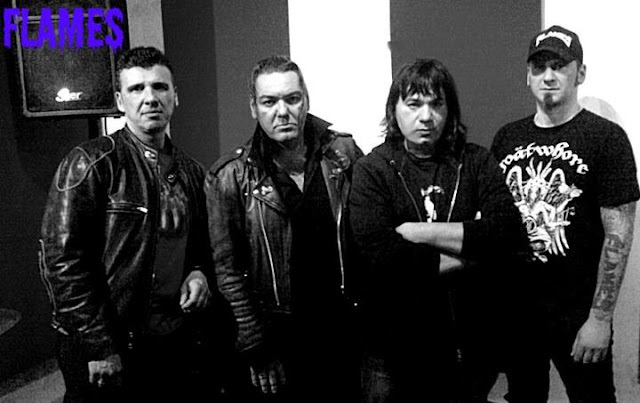 Alex: It’s true that we were one of the first bands that played thrash in Greece and the first who played professionally in our country and the first Greek band ever that had great sales in whole Europe. The scene here in Greece was very small we had just a few bands who played professionally like Spitfire, but we had a lot of small bands playing great music like Ripper (power metal), Vomit (they had their own style something like Voivod), Acetic Voice from Thessaloniki and later Raw Silk (really great posers they could make a great career if they had a good manager and record label). Elias: You got a lot of good reviews back then and played many concerts, some of them supporting great Heavy Metal bands. Share some info with us about those days. Alex: This years was really great I remember a lot of great gigs I will share the most important with you. 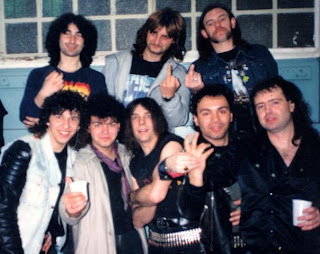 First 1987 we played as headliner at club 22 in Athens in a sold out hall in front of 1000 crazy headbangers, then in early 1988 we played as special quest with Motorhead, 3 days of sold-out gigs and 4000 fans every day. Very important were our first two gigs in Germany also. In 1988 with Living Death was the first time that we were in Thessaloniki at Elispondos. This hall had a capacity of 800 people there was over 1000 inside. We also played in Greece with Kreator, Sodom Running Wild, Destruction, D.R.I. but the greatest experience was touring Europe with Sodom and Assassin for 2 months in sold out halls. 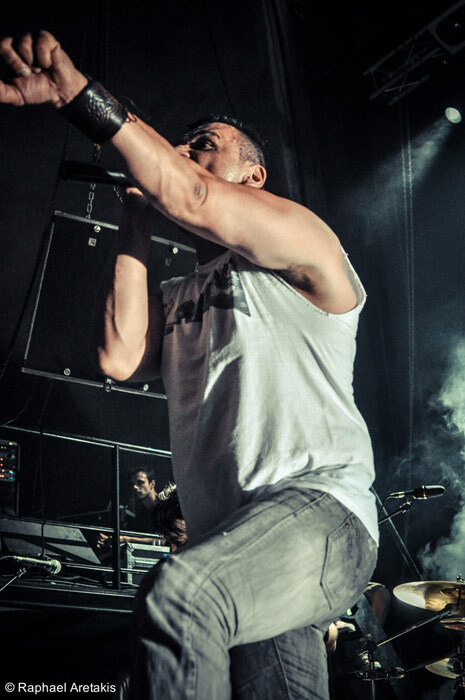 Elias: I know that the Greek music industry wasn’t very “kind” to Heavy Metal bands back then. You were also asked to sign with one of the greatest companies, NOISE records back in 1989 which didn’t happen and later on you and the band parted ways. What was the situation in FLAMES back then? 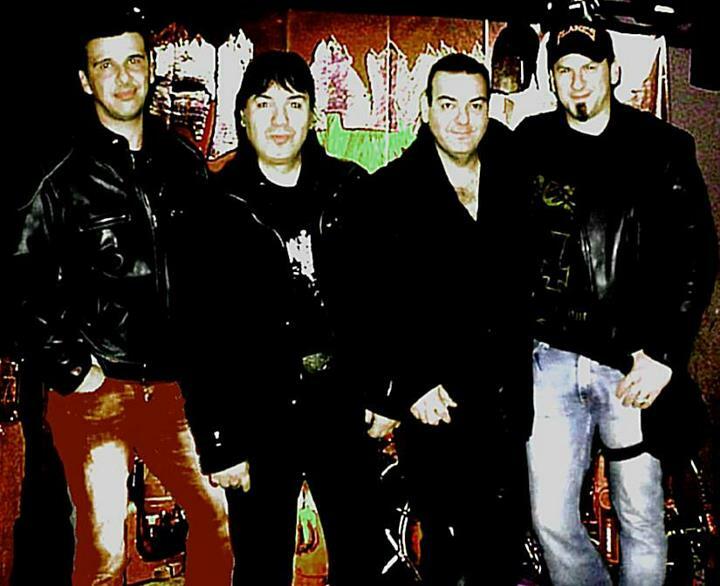 Alex: The good thing with us was that we had a contract with black dragon records one of the most important labels in Europe at the 80s and 90s, they promoted our 2 albums “Summon The Dead” and “Last Prophecy” which made really great sales in Europe and overseas to. Its also true that in 1989 NOISE contacted us to make a contract (we still had a contract for one more album with B.D.) but then we decided after long thought to stay at B.D. were we were one of the major bands and not maybe number 12 or 15. But yes we understood later that it was a mistake not to join NOISE. One year later I left flames to go to study in Germany and then England. Elias: During the time since you left FLAMES up until now, where you active in any music projects or music in general whatsoever? Alex: After I left flames for a lot of years I had done nothing with music 1995 we tried a reunion but I had no time to do this because of business, 2004 we tried again but also didn’t have enough time. All this years with some friends we had a band and played cover songs some times at clubs (not thrash, mostly hard rock and heavy metal). Elias: Ok, back to today. Reunion with FLAMES. How did that happen after all those years? Did you keep in touch with the rest of the members? Alex: As I told you it was a thing we tried a lot of times, now we were ready to do this. In January we started our first rehearsal and now we keep going on. 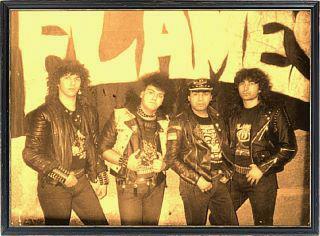 Our thought was to bring together the original 1986-1991 Flames, the years with the great success of the band. Unfortunately we could not find George our drummer, but we were really lucky that we found Alex, he fits great in the original line up and he is a great drummer. Elias: You recently played a concert in FUZZ CLUB supporting SEPULTURA. And if I’m correct you played another concert in Germany. What are your memories of those fresh gigs? Alex: We will play September in Germany, Fuzz was the first gig for the reunion, it was a very good warm-up for all the things that will follow. Elias: Do you believe that you and the band have “grown” since their first old school days? How do you see the Heavy Metal scene of today? Alex: After so many years yes I think we start again with more experience you will se that when you year the new songs, but we still play original thrash metal. The metal scene today is similar like it was at the 80s and 90s a lot of bands old and new tried to change their style and sound but like you can see, the fans prefer the original sound. I am very disappointed with the Greek scene there are a lot of small bands playing great music but nobody promotes them, from the most popular bands for my opinion only Rotting Christ are doing a great job. Most of them just promote their 40 gigs in Europe or overseas but they don’t say to anyone that they play in front of 40 or maybe 60 people. Yes I know I’m being a bad guy but that’s the truth. Sorry but, like I said from all these bands only Rotting Christ really have an international career. Elias: FLAMES have changed their lineup many times. Should we expect this reunion to be something more permanent or not? Do you plan to release new stuff? Alex: This reunion will last and we have big plans. We already have 16 brand new songs ready and we will start recording them at the end of August, we will also have a new record again. Elias: What are your tour plans from now on? Do you have any more gigs in store for the Greek fans? Do you have any more invitations to play abroad? Alex: Like I sad we play in Germany in September and then again December at 2 festivals, at October we play 4 gigs in Greece, except those dates our manager is available for more live shows all over Europe after the release of the album. Elias: What are your activities besides FLAMES? Alex: I own a gym in Athens and I work also for a major coffee company as store manager. Elias: Is there anything else that you want to share with us? Alex: We are really happy to be back and we promise you that our new songs will be the best flames songs ever. SOME PEOPLE MIGHT NOT LIKE IT BUT WE ARE BACK TO PLAY ORIGINAL THRASH METAL. Thanks Elias for everything, your site will be the first that we will send next month a teaser of a new song and two great old songs Jesus Christ and Sea of Blood. We are in contact with two major German record companies and the release of the new stuff will be at end of the year.